AB InBev seems to pump as much cash as beer out of its business. It is the world’s biggest brewer, responsible for the Budweiser, Stella Artois and Corona brands, and even with a 2 percent annual decline in volume it poured 426 million hectolitres of grog in 2013. That’s enough to fill 17,000 Olympic-sized swimming pools. Revenue grew to a massive $43.2 billion and EBITDA, thanks to the company’s dedicated focus on cost control, expanded 8.1 percent. Cashflow from operating activities runs at about 30 percent of annual revenue. There are questions. Though officially a Belgian company, the larger parts of AB InBev’s businesses are in the Americas. In the north, doubts circle about the maturing nature of its business. There are potential health-lobby issues too. In the south, AB InBev is exposed to emerging-market wobbles. Yet the clear message from management on Feb. 26 is that markets north and south are on the up. M&A continues to play a large part in the AB InBev story. Grupo Modelo and Oriental Brewery are the latest big catches for this proficient and prolific deal machine. Big deals such as these inevitably bring the oft-predicted end of global beerage M&A closer, but the industry still has room for more consolidation. Besides, AB InBev said on Feb. 26 that even if the acquisition pipeline dried up, organic growth could fund chunky share buybacks as well as conventional dividend growth. The 21 percent increase in the ordinary annual dividend for 2013 tells its own pleasing story. So does AB InBev’s stated ambition to maintain a 3-4 percent dividend yield on the shares. And despite all the deals, AB InBev’s ratio of net debt to EBITDA sits only a shade above the two times level it says is a sustainable norm. AB InBev shares trade on 19.4 times the expected earnings this year, a 9 percent premium to the peer group average as calculated in Thomson Reuters Eikon. That premium-strength rating looks justified. It is certainly hard to see why investors’ taste for the stock will wane soon. 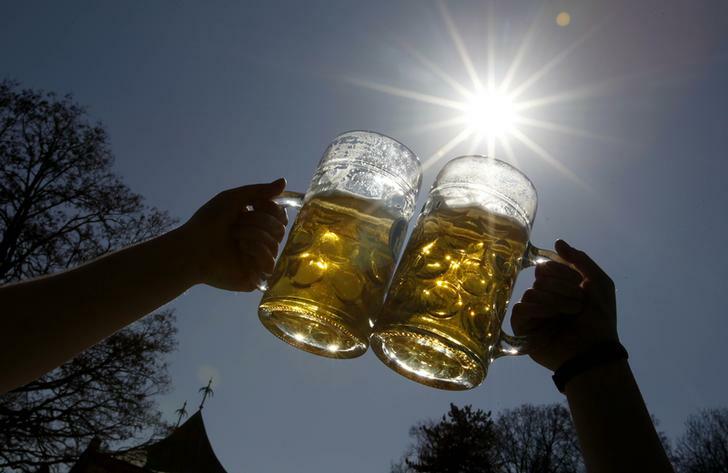 People pose for a photograph as they toast with beer on a sunny day in Munich's English garden 'Englischer Garten' . AB InBev, the world’s largest brewer, increased earnings before tax, interest, depreciation and amortisation by 8.1 percent to $17.2 billion in the year to Dec. 31. In the fourth quarter, EBITDA grew 13.1 percent. It raised the full-year dividend by 21 percent to 2.05 euros. The company said it expects to see an improvement in the trend of U.S. industry volumes compared to 2013. It said it expects the Mexican beer industry to return to growth in the current year and Brazilian beer industry volumes also to resume growth, helped by the 2014 FIFA World Cup. It also expressed optimism about China. Shares rose 1.2 percent to 75.13 euros by 0900 GMT.